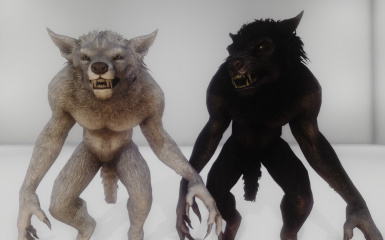 This mod allows the player to have a unique werewolf form. If you find a bug, please report it in the comments. NOTE: The base mod comes with the vanilla mesh and vanilla/official HD textures. 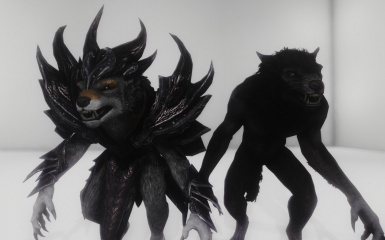 This mod must use plugins provided by the authors of werewolf mesh/texture mods. Advanced users can manually override the meshes/textures, but must keep in mind that any replacer meshes have to be modified to use the correct texture paths. The file path layout can be found at the bottom of this page. Thanks to Saiodin for featuring my mod in episode #111 of his Skyrim Mod Series! 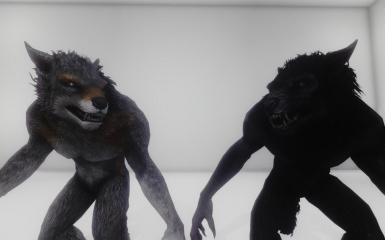 This mod makes the player's appearance in beast form differ from that of any other werewolves by adding subfolders (Male & Female) to the werewolf mesh and texture folders. The base file contains the vanilla meshes and textures which can be replaced by installing any of the plug-ins listed on this page. If you need some tips on installation; see the text at the bottom of the Plugins section. To ensure that the appropriate authors get credit, any plugins for this mod will most likely be found on the mod pages of the mesh/texture authors and links to their mods will be provided here. This mod will only move as quickly as other authors allow so if there is a mesh or texture you want specific to your character, ask the authors! Comes with an installer for installing the eye textures and body textures independently. (Found in downloads on this page) Original mod found here. Comes with an installer for installing the eye textures, body textures, and mesh independently. Comes with an installer for choosing between two available meshes for female werewolves. The base mod must be installed first! Texture plugins should be installed after other plugins! Not all plugins are compatible! This mod is incompatible with any races that do not use vanilla skins (in other words: races with alternate textures/meshes). I may look into creating patches. Make werewolf gameplay a bit more interesting with lunar transformations, contagious lycanthropy, and more! Turn your followers into werewolves so that they can appreciate your new look and individuality! Allows werewolves to occasionally spawn in the wilds, providing further contrast between your character and the other werewolves of Skyrim (and Skyrim could really use more werewolves). Like nice, clean teeth on your werewolf but feel that the other folk of Skyrim might like some pearly whites as well? Download 83Willow's full mod here!